Sunday 18th of May 2008, a new, modern version of Brushytten cabin was finished. The new Brushytten is drawn by Mette Rakner from Tippetue architects, and it is run on a voluntary basis by the members of Skanseguttenes Association. Brushytten cabin is usually open on Sundays from kl.11.00 – 16.00. As is tradition, you can buy something warm to drink here. To get to Brushytten cabin, go for a nice walk of just 1,8 km (11,1 miles) one-way, calculated from Fløibanen’s uppermost station. The walk takes you along graveled roads and paths in hilly forest terrain. There are many trips on Mount Fløyen that will lead you to Brushytten. You can also choose to stop at any of the other “rastehytter” (resting cabins) along the way. From Brushytten you can decide to continue the hike further up on Blåmanen and Rundemanen mountains. This trip is an excellent choice for families with children. 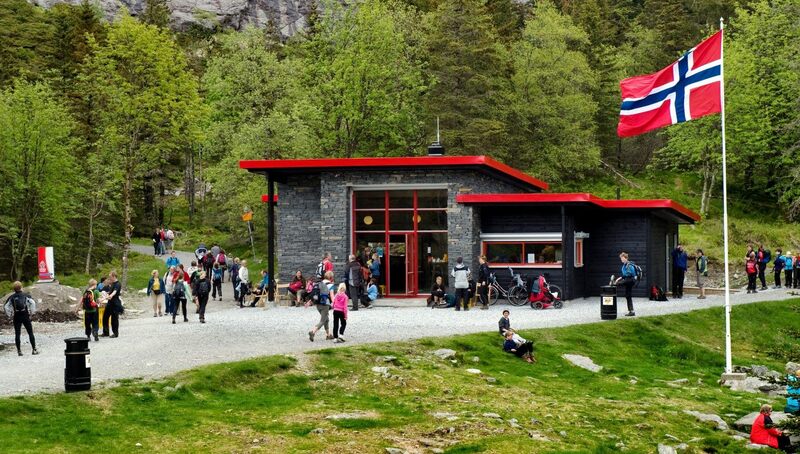 Check here for more walks and hikes from Fløyen!